In the advent of pervasive computing technologies, the ubiquitous healthcare information system, or U-health system, has emerged as an innovative avenue for many healthcare management issues. 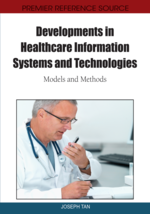 Drawing upon practices in healthcare industry and conceptual developments in information systems research, this paper aims to explain the latent relationships amongst user-oriented factors that lead to individual’s adoption of the new technology. Specifically, this study focuses on the introduction of chronic disease U-health system. Using the Ordinary Line Square (OLS) regression analysis, we are able to discover the insights concerning which constructs affect service subscriber’s behavioral intention of use. Based on the data collected from over 440 respondents, empirical evidences are presented to support that factors such as medical conditions, perceived need, consumer behavior, and effort expectancy significantly influence the formation of usage intention. Ubiquitous computing can be defined as the “contemplation of today's computers communicating each other through wireless network in actual activities of everyday life” (Weiser, 1993a; Weiser, 1993b). Some articulate such concept as the embedded computers in walls, refrigerator, tables, and objects in the surrounding environment (Rhodes & Mase, 2006). In other words, computer is expected to become an ubiquitous resource, much similar to the light with a switch and water with a tap. Two functionalities, computing tasks and telecommunications, are required to realize the features of ubiquitous computing such as localized information, localized control, and resource management (Weiser, 1993a; Rhodes & Mase, 2006). The evolving mobile technology has expanded the applicability of ubiquitous computing to areas including virtual reality, head mounted display (HMD), wearable computing, and smart office room (Weiser, 1993b). An agile, responsive, and location-aware service delivery system is highly desired by the healthcare management business. Correspondingly, ubiquitous computing allows patients to receive prompt medical care anywhere (home, office, outdoor, or hospital) and any time (24 hours / 7 days), thus improving the service quality and decreasing the risk of medical treatment failures. For example, a doctor can check the status of a patient in a real time manner using the sensor which is installed in patient’s home or attached to the patient’s body. In case of emergency, the sensor can detect changes of the patient’s health condition in the early stage and automatically contact the designated hospital to initiate treatment procedure. Moreover, medical expenses have been continuously surging in the past and present years due to aging population and increasing demand for chronic disease management. Facing the soaring healthcare cost, many countries attempt to encourage patients to leave hospitals as early as possible and introduce medical services that are portable and effective for treatments. These efforts require treatment that delivers remote medical service to patient’s own residence (Kang & Lee, 2007). Hence, a medical service utilizing ubiquitous healthcare technology offers an innovative solution that allows patients to access medical service whenever and wherever. In the sense or market demand, taking South Korea as example, the U-Health market is expected to be worth $150 million (in USD) in 2010 with 7 million subscribers in their 30s~40s (Jee et. al., 2005). In summary, we define the U-Health system as the use of ubiquitous computing technologies to support expeditious and personalized communications, activities, and transactions between a medical service provider and its various stakeholders. In the literature review section, Figure 3 describes the layout of U-health system and its associated stakeholders. Despite the strong potential of the technology, however, the studies of ubiquitous healthcare services are not widely conducted. Existing literature has focused mostly on pure technical concerns or system development process; whereas managerial issues and behavior perspectives of U-Health system application are largely overlooked. In this paper, the authors discuss the issue of applying ubiquitous computing technology to healthcare management from end user’s perspective. The main goal of this paper is to identify and investigate the factors and their inter-relationships that affect end user’s intention of adopting U-Health system. For example, one critical factor is effort expectancy, which refers to the degree to which the user believes it is easy to use the technology. Theoretically, the effort expectancy is positively correlated with behavioral intention of use, namely, the easier the user finds to use the product, the more likely s/he will adopt it. A more thorough articulation of these factors can be found in the Research Model and Hypotheses section.